The wind was forecast to freshen from 6 kts to 7 kts during the beat. That changed the optimum pointing angle from TWA=43.3° to TWA=42.0° at the mark − just one more thing to keep track of. Rumskib was keeping me company − matching tack for tack. I looked at that as a mixed blessing. We would stay close for the rest of the race. We left Rakino Island to port and split the smaller islands to the NNE. The wind continued to back. 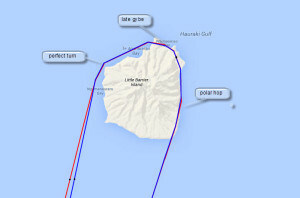 We both kept to the left of the rhumb line on the outbound reach to Little Barrier Island. The mark for Little Barrier Island was set well inland. Actual rounding involved five legs and six headlands. The first leg was the longest and presented an awkward TWA. It begged for a polar hop. With help from SPINNACER, a polar hop worked. The third leg was a run. Didn’t see that early enough and was late on the gybe. The fifth leg began with a crisp turn − spot on the heading and timed to the second. It was like a golfer who sinks a shot with pitching wedge from off the green. Lucky, for sure − but thankfully received nonetheless. 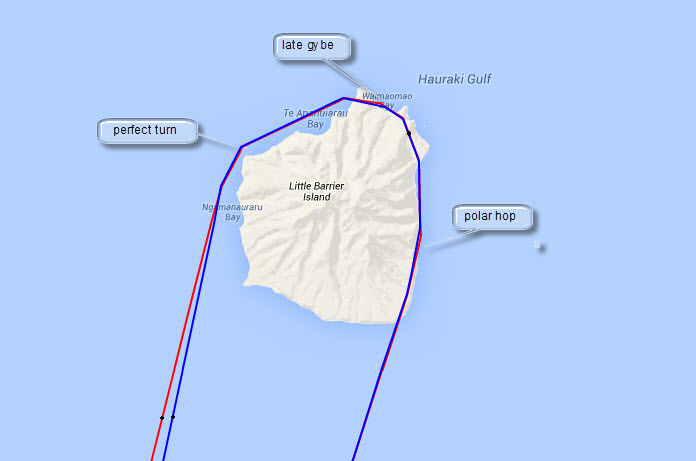 After the rounding, and with the race lead, I breathed a sigh of relief and set a course for the next mark. Meanwhile, rumskib was edging east, above the rhumb line. Neuroman, Tyger, zero, and rafa followed rumskib. The falling TWS and now clocking TWD favored that side of the course. 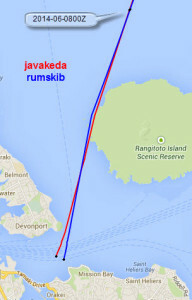 Approaching Rangitoto, this time from the north, rumskib and javakeda were dead even again. 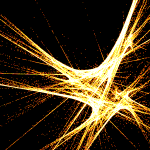 I had a plan to delay heading for North Point and get a better wind angle − really a mini-version of what rumskib had just done to me. But then rumskib and Neuroman went wide around Rangitoto and rumskib set a course for the center of the finish line. I learned in chat that rumskib was doing some IRL sailing and had set DCs. That would cost him any chance of winning the race. I’m left wondering what the result would have been if rumskib had been able to hand-sail to the end. There is no way to know who would have finished first. But, for sure, it would have been very close!